Van Jones, CNN host, best-selling author and social entrepreneur, has been named the 2018 Visiting SAGE. 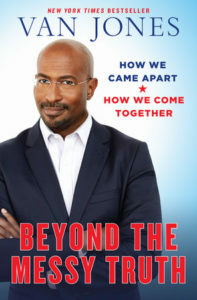 Jones will be appearing in Portland to discuss his new bestseller Beyond the Messy Truth, a passionate manifesto that exposes hypocrisy on both sides of the political divide. ￼Jones will speak at the Governor Ballroom (4th Floor) in the Sentinel Hotel at 7 PM on September 12, 2018. He will offer a blueprint for transforming collective anxiety and strife ￼into meaningful solutions. SAGE (Senior Advocates for Generational Equity) is a Portland based nonprofit dedicated to raising awareness about the challenges facing coming generations. Prior Visiting SAGEs include New York Times columnist Nicholas Kristof, Harvard Professor Robert Putnam and climate activist Paul Hawken. ￼The event is presented in partnership with the Coalition of Communities of Color, an alliance of ￼culturally-specific organizations supporting collective racial justice efforts to improve outcomes for communities of color. Prisma Point, a regional management consulting firm, is the executive producer of the event. About Van Jones. 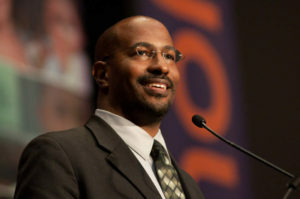 Van Jones is a social entrepreneur, CNN political contributor and host of The Van Jones Show on CNN. Jones is a Yale-educated attorney, former adviser to President Obama, and the author of three New York Times best-selling books, The Green Collar Economy (2008), Rebuild the Dream (2012), and Beyond the Messy Truth (2017). Van has received numerous awards and honors, including Rolling Stone’s 12 Leaders Who Get Things Done, Fast Company’s 12 Most Creative Minds On Earth, and TIME’s 100 Most Influential People in the World. 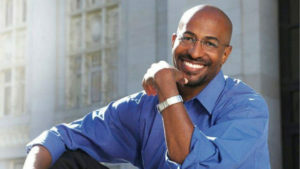 For more information, visit www.vanjones.net. About SAGE. Senior Advocates for Generational Equity is a nonprofit organization that inspires people over fifty to give forward with their time, money and voice so that younger and future generations can thrive. ￼The Visiting SAGE program inspires people to find new pathways to ￼civic service to strengthen our communities and to improve opportunity for coming generations. ￼For more information, visit www.wearesage.org. About CCC. The Coalition of Communities of Color is an alliance of culturally-specific community-based organizations. The CCC supports a collective racial justice effort to improve outcomes for communities of color through policy analysis and advocacy, culturally-appropriate data and research, and leadership development in communities of color. For more information, visit www.coalitioncommunitiescolor.org.